Explanation: The Sun's disk was totally eclipsed for a brief 20 seconds as the Moon's dark umbral shadow raced across Pokwero in northwestern Uganda on November 3rd. So this sharp telescopic view of totality in clear skies from the central African locale was much sought after by eclipse watchers. In the inspiring celestial scene the Moon just covers the overwhelmingly bright photosphere, the lower, normally visible layer of the Sun's atmosphere. Extending beyond the photosphere, the reddish hydrogen alpha glow of the solar chromosphere outlines the lunar silhouette, fading into the Sun's tenuous, hot, outer atmosphere or corona. 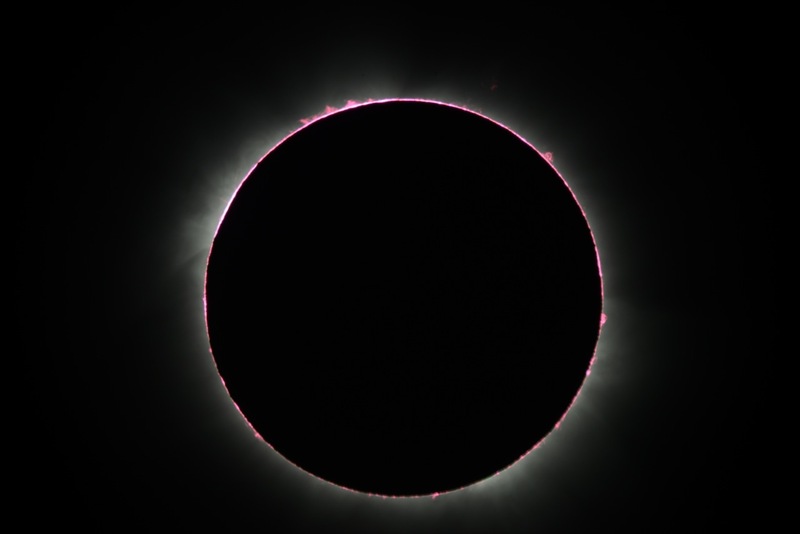 Planet-sized prominences reaching beyond the limb of the active Sun adorn the edges of the silhouette, including a cloud of glowing plasma separated from the chromosphere near the 1 o'clock position.